Discover Old World charm in the Mediterranean with a holiday at the family-owned, beautifully maintained Club Pyla Beach Resort in Cyprus. Situated just a few hundred meters from the blue waters of the Mediterranean, this cozy resort is the perfect retreat for families, couples, and newlyweds who want a relaxing vacation and the best in pampering. With 44 apartments decorated in true Mediterranean style, the resort beckons those who love water sports, sunbathing, and sightseeing. 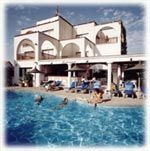 Near to some of the region's best-known visitor attractions and historical landmarks, you have the opportunity to buy one of these Cyprus timeshares for sale here at BuyaTimeshare.com. Imagine owning your very own resort apartment in the Mediterranean, with costs much less than renting a traditional hotel unit. Club Pyla Beach Resort has studio-size, one- and two-bedroom apartments located in low-rise buildings near the beach. 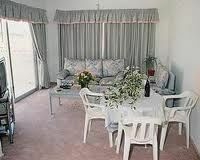 The studios and one-bedrooms have a queen or double bed, partial kitchen, and full-service bathroom. The larger one-bedroom apartments have a master-size bedroom with queen or double bed plus a pull-out sofa in the living room. These units also have a complete kitchen with refrigerator and microwave. The larger two-bedroom timeshare apartments have double beds in both bedrooms plus a pull-out sleeper sofa. These units also have a full kitchen and dining room, and a full bath in both bedrooms. All units have large-screen TVs and sliding door access to a private veranda. The Club Pyla Beach Resort is close to the famous Zenobia shipwreck, accessible by scuba diving. You can even enlist the service of your own private diving instructor while staying at the resort. Downtown Larnaca, located near the resort, is full of gift shops, museums, and fine dining establishments. Tours of the southwestern portion of the island of Cyprus can be arranged. The resort contains a lounge bar and restaurant, pool with pool bar, and full-service health center with fitness room. 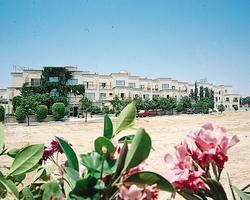 Families and couples will find no end to the fun in the sun while staying at this fabulous vacation resort, and ownership of one of these Cyprus timeshares for sale means enjoying all the perks that come with membership. Contact Club Pyla Beach Resort Specialist Today!